"Hadoken!" That famous battle cry from Street Fighter 'representative' Ryu (Capcom prominently places him at the center of much Street Fighter media) has resonated with gamers since the early days of the Street Fighter II arcade game. Since the original Street Fighter II's arcade release in 1991, numerous sequels and spin-offs have helped cement the Street Fighter series into one of the most popular fighting game franchises of all time. It’s unusual, but the handheld market has not traditionally been the platform for major fighting games. 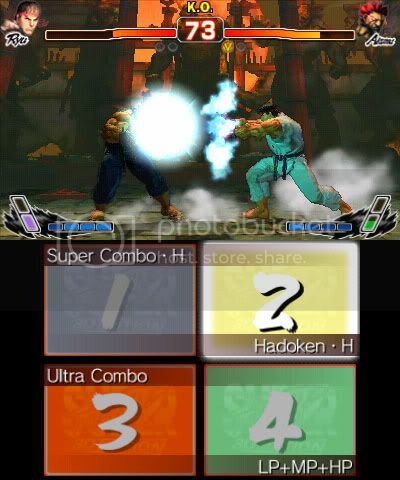 In a way, SSF IV 3D is Capcom’s way of saying "This is how you do a handheld fighting game!" Thus, the 3DS launch lineup starts off with bang that sets a new standard for 3DS games to follow, not just for fighters but 3DS games in general. First off, a disclaimer: I am not a particularly good Street Fighter by any means, and my experience with the SF series has been very hands-off following the SNES days (though I was quite passionate about the SNES games, particularly Street Fighter II Turbo). Thus, I am only now seeing, all at once, all the gradual improvements that have made it into the series over the years. Super Street Fighter IV is a sufficiently deep fighting game. If you’ve played other incarnations of Street Fighter IV (it previously appeared on the HD consoles), you know what to expect here: Basic combos, Super Combos, Ultra Combos… In fact, a quick glance at the instruction booklet gives you a ‘beginner’s guide’ to learning how to play. Just going down the list, your character can: dash, use throws and throw escapes, recover from a fall, utilize ‘focus attacks’ either alone or within other combos, and enhance special moves to ‘EX mode’ at the cost of your Super Combo gauge. Most of these basic concepts are fairly easy to grasp with some practice but much more difficult to pull off in the heat of battle, considering you have to make quick decisions on which move you should use and what can counter another move. In-game help is available to help you become a better player. First, a Training mode lists out all the inputs for all your special moves and Super/ Ultra Combos, as well as character-specific moves. This particular mode is pretty bare bones; I would have also liked to see a short clip for some of the moves showing exactly what the move accomplishes. The next level of practice is found in Challenge mode, where you are given specific instructions for pulling off some devastating manual combos that are essential to your success against other players. The hardest part is remembering it all! As a Street Fighter IV ‘noob’, I easily got my money’s worth with this game. According to the 3DS activity log, I have played this game for over 21 hours, and I feel like I’m just scratching the surface of what this game has to offer, especially considering I have only sampled a small percent of the 35 (!) available characters. I find it compelling to familiarize myself with as many characters as possible and even understand the difference between each character’s Ultra Combo (you can choose 1 of 2 prior to a fight), as some Ultra Combos are utilized in completely different manners. You always have to be prepared. And the core gameplay goes beyond these concepts, as evidenced in my futile attempts at challenging some of the seasoned players online …. But how does the game control on the 3DS? It’s a mixed bag. The 3DS D-Pad is a bit uncomfortable to use for pulling off complex maneuvers consistently, especially when you need quick reflexes. The Circle Pad is much more comfortable, but its analog nature makes it difficult to make accurate inputs or clearly distinguish among the 8 digital directions you intend to make. The L and R shoulder buttons are also tricky to master when you’ve got your other fingers sprawling across various locations on the 3DS. This is where the touch screen comes in and makes up for 3DS’ controller inefficiencies to map well to an arcade fighter like SSF IV. The touch screen basically enables you to map certain moves or button combinations to one of four large touch panels. In the heat of the battle, the touch screen is very accessible, and the touch panel becomes another ‘button’ for your thumb to move over to. The left side of the touch screen is not quite as accessible for your thumb, but I was able to manage pretty well. The game gives you enough customization options to make the game as easy to play and control as you want it to. What does the 3D screen bring to the table? It doesn’t add anything to the gameplay considering the game is a 2D brawler, but the 3D screen serves to enhance what is already a gorgeous looking game to begin with. All character models are highly detailed and polygonal and have excellent depth. The backgrounds are somewhat of a disappointment due to their static nature; there’s no animation in the crowd, you are simply looking at some artwork representing, say, a crowded market place. The stillness of the background looks very unnatural, yet it still looks wonderful in 3D because the overall effect is that of a diorama or movie set. You can clearly see every object’s relationship in the 3-D space with one another. 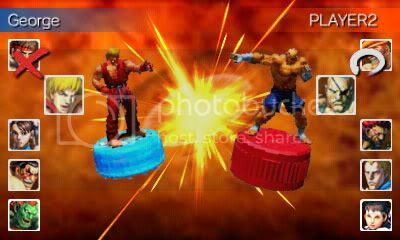 The 3D also adds an intense feel to the match when you switch the camera view to Dynamic, where the camera switches to an over-the-shoulder view, which looks nice but unfortunately impedes your ability to anticipate the opponent’s move set. To top it all off, the animation is fluid and the framerate doesn’t take a hit. This game is very pleasing to the eye. Another way to appreciate the 3D screen is to look at the StreetPass figurines. They have a nice holographic quality to them and actually appear to hover just outside of the 3D screen, almost to the point where you feel you can reach out and touch them. Several characters show off their Ultra Combos beginning with Sagat at 0:30. In 3-D the effect has dramatic flair.NOTE: The actual game does have music and it rocks. What are these StreetPass figurines I speak of? 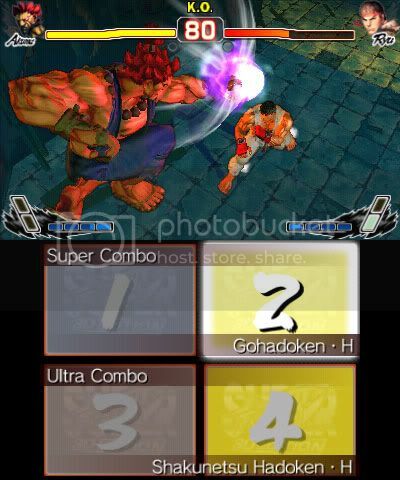 Well, SSFIV incorporates a number of 3DS’ unique features, including StreetPass. As you play the game, you earn Figure Points (FP) that you can spend on at roulette so that you can win character figurines, which range from level 1 (weak) to level 7 (strong) depending on their battle stats, and you can collect up to a maximum of 500 figurines. You can create a team of 5 characters (your strategy is to balance the team based on their stats), and when you activate StreetPass, your team battles someone else’s team. Gotta collect ‘em all! The online matches offer extended replay value. You can quickly play a random online match, or customize your random matches so that you are paired with someone who is around your skill level. Your online skill levels are measured in two ways: Battle Points (BP) and Player Points (PP). Every time you win an online match (whether it’s a random match or a friend match), you earn PP. The character you used earns BP. BP indicates how good you are with that character, while PP is an overall grade of your wins in general. The online friend match structure is pretty basic. One person creates a lobby, and waits for a friend to join. You can’t send an invite to someone through the game (and unfortunately the 3DS friend list on the main menu doesn’t have a message system, even though you can see which of your friends are online and what game they’re playing). There’s also no voice chat, though I wonder if the quality using that 3DS microphone would be good enough anyway. 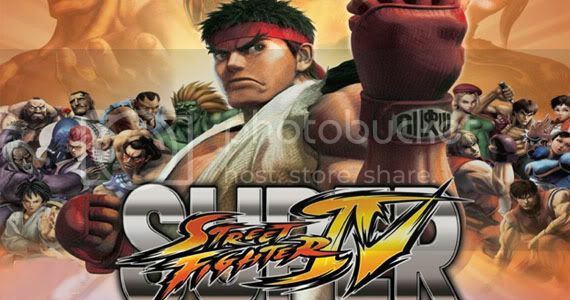 To sum up: Super Street Fighter IV: 3D Edition is a deep 2-D fighting game with plenty of content and high replay value, beautiful graphics, and very customizable control schemes. If you’re new to Street Fighter IV and have an interest in checking out the 2-D fighting game genre, this game absolutely delivers. If you’re already familiar with the Street Fighter IV series on other platforms, I would still recommend this title, primarily due to the excellent 3D graphics and the game’s portable form. You need to spell n00b with zeroes! Other than that, good review. The touch specials work surprisingly well. And they're deliciously cheap! I'm not sure if voice chat would work, but you should at least be able to yell "HADOKEN!!" to do a fireball. Thanks! Haha, yeah, I don't really know my internet language that well, I didn't even bother looking up how to spell n00b. Oh wells! Hhmm, voice activated Street Fighter. "Ryu, I choose you! Use... Tatsumaki Senpukyaku!" Great review. I love your writing style!! Very clear and concise points, with accessible transitions and conclusions, all wrapped in a faint air of exuberance. Your writing style, layout, and overview makes for an inviting read. Good Job! Once I have my new baby on a regular sleep schedule, we should battle it out online! @GameDadGrant Oh most definitely, I'll see you in the Super Street Fighter Boot Camp! "That famous battle cry from Street Fighter ‘representative’ Ryu (Capcom prominently places him at the center of much Street Fighter media) has resonated with gamers since the early days of the Street Fighter II arcade game." Why...why stop at 2? Why not just say 'Street Fighter' arcade game'? Just curious. Did he not say it in the original? I'm not sure if he actually said it in the original Street Fighter arcade. I never played it myself. So I looked up some videos, and Ryu does seem to say something when he throws the Hadoken (I may have misspelled it, I've seen it as "Hadouken" as well). At 0:25 you can make out a garbled "Hadoken." But the intent of my opening statement is that it wasn't until SFII that the "Hadoken" became iconic among a mass audience of players. For most gamers growing up at the time, SFII was their first Street Fighter experience, as well as being the first to have a huge impact on the game industry as a whole. Great review@roykoopa64! One of the reasons I didn't like Street Fighter 3 is because Ryu wasn't the "main" character, it was some muscle bound dude with no personality named Alex. Also, most of the character from previous Street Fighters were replaced with new boring or weird characters. That is why I love Street FIghter IV so much. It's everything that Street Fighter III should have been. By the way, the only thing that I don't agree with you, though it's a matter of taste, is the D-Pad. I find that performing moves using the 3DS D-Pad is far easier than using any other D-Pad out there. I can throw Hadoukens and Shoryukens with this thing like it's nobody's business. I only use the C-Pad in this game for circular moves such as Zanfief's Spinning Pile Driver. It helps a lot, but like you said, it's difficult to judge directions in this kind of game when using it. All in all, awesome job. I look forward to fighting with you online one of these days, when I'm not working. [Goes to take a shower and then off to work]. Looking forward to an online match as well! Hmm, you do have a point about Street Fighter III. I never played the game, and I don't really hear a lot of people talking fondly about what a great sequel it was to SFII. I guess in general it wasn't as well received among the fans? Maybe I should have been more clear in my review about my personal control preference. I actually play exclusively with the D-Pad, so I completely agree that it works just fine for most of the moves. Unlike your preference, I even rely on it for characters like Zangief with 'full circle' moves (Hakan's Oil Rocket is another example). We have a slight difference in control preference, but that's the beauty of the game. All these options are a good thing! I like Pro control (vs. Lite) since I would rather input the directional commands for the Super and Ultra Combos, but I still rely on the touch screen for a few things, particularly 'hit all three punch or kick buttons simultaneously.' So really, it's not the D-Pad itself I have a problem with, but rather the combination of all the other buttons, which is why the touch screen panels becomes such a nice addition.